I have written a number of Sharkfest Recaps before, and I felt I needed to do something a little different this time. Instead of talking about sessions of myself and others I’ll shine a light at things that you can’t see at the Retrospective page where you’ll find all the presentation materials and videos. I want to give you some “behind the scenes” stuff that you may not know yet, or that isn’t always available elsewhere but did happen at Sharkfest or around it. That’s a whole different level now (yes, it’s from Sharkfest US, but the recording setup was identical or even superior at Sharkfest EU, because audio was picked up from the speaker microphone directly into the recording). There was a lot of work done by Angelo Spampinato who, as a one man show, records all three rooms with the best quality possible, and keeps improving his setup all the time. If you wonder why not all videos on the Retrospective page have the camera picture at the lower left, it’s because he can only be at one place at the same time, handling the camera. The two other rooms are only screen- and audio-recorded, which is still a lot more than we had before. And in case you want to ask me why not all talks have videos – every presenters has the option to opt-out of being recorded if they don’t like it or if they show pcap files that contain information they don’t want to be recorded. There is sometimes a fine line between “I can show this to the room of 50 people” and “everybody on the Internet can watch it until the end of time”. If you wonder why that’s a difference – sometimes the sensitive stuff is hard to find, so the room won’t have time for that during the live presentation, but if you can rewind and watch its recording as often as you like it’s a different story. So let’s please have a virtual round of applause for Angelo, doing a great job! The “Packet Doctors” session is a very special slot in the agenda that appeared for the first time at Sharkfest 2017 US in Pittsburgh. 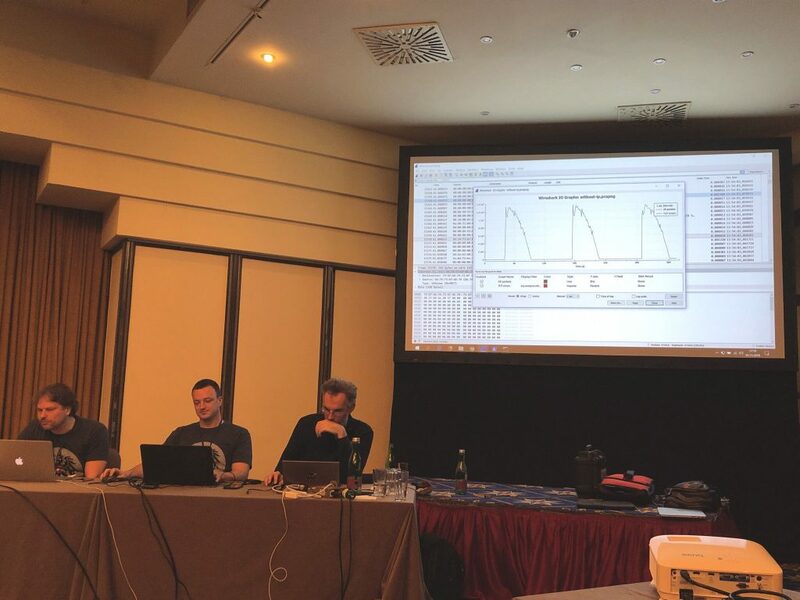 A couple of presenters had toyed with the idea of doing live packet analysis in front of an audience for quite some time, and last year we gave it a try. 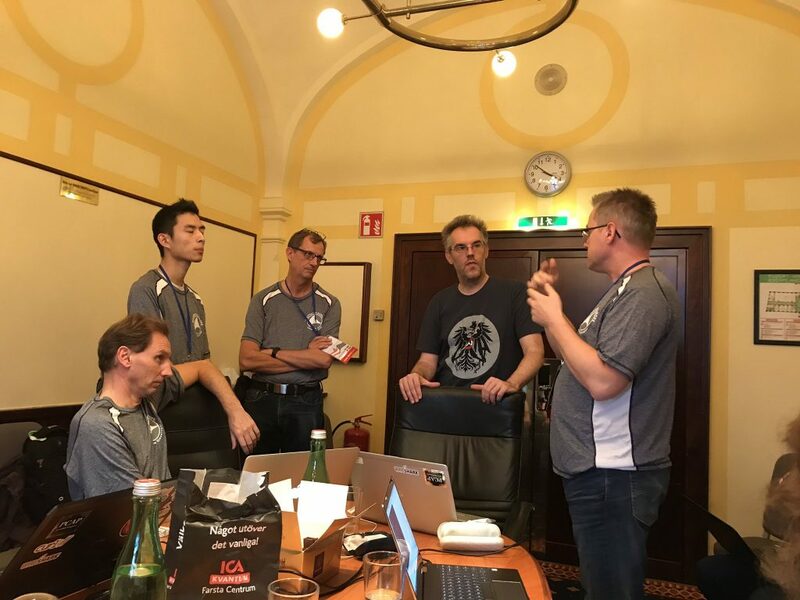 In Pittsburgh it worked out pretty well – the doctors (Christian Landström, Hansang Bae, Sake Blok, me) actually solved a problem where a gigabit link could only be used to a fraction of it’s bandwidth. We were able to show that there was an artificial cutoff at 100MBit/s in the packet capture. It turned out to be a bandwidth license problem on a WAN device, and when that license was updated the problem went away. The “Developer Den” is a room that is reserved for the Wireshark core developers. But make no mistake – it’s not exclusive to them: you can walk in almost at any time and talk to them about their work on Wireshark, about bugs/problems that you have, enhancements that you would like to see, and everything else. Sometimes they have “closed door” meetings where everybody else gets kicked out (in a friendly way), and that’s fine, of course. Johannes Weber (presenting at Sharkfest for the first time) needed a feature in Wireshark that would tell him the response time of an NTP request to be able to see how fast the NTP server answered the query. Something like that already existed for DNS, but not NTP (and it needs to be coded, because it’s a relationship between packets which cannot be filtered on unless there’s a field). He was able to get Sake and Pascal interested in his topic, and so it was implemented by Pascal in no time. The same thing can take weeks/months as a feature request on the bug tracker because there’s so many items there – but if you show up personally, it often gets done much faster. The Wireshark TCP expert is part of the TCP dissection code. This means that the same block of code dissects the TCP header that also tries to determine problems and symptoms, like “Fast Retransmission”, “Window Update”, “Previous segment not captured”, etc. If you ever want to look the code doing that, here it is. I read it every once in a while and it is a beast of a dissector. 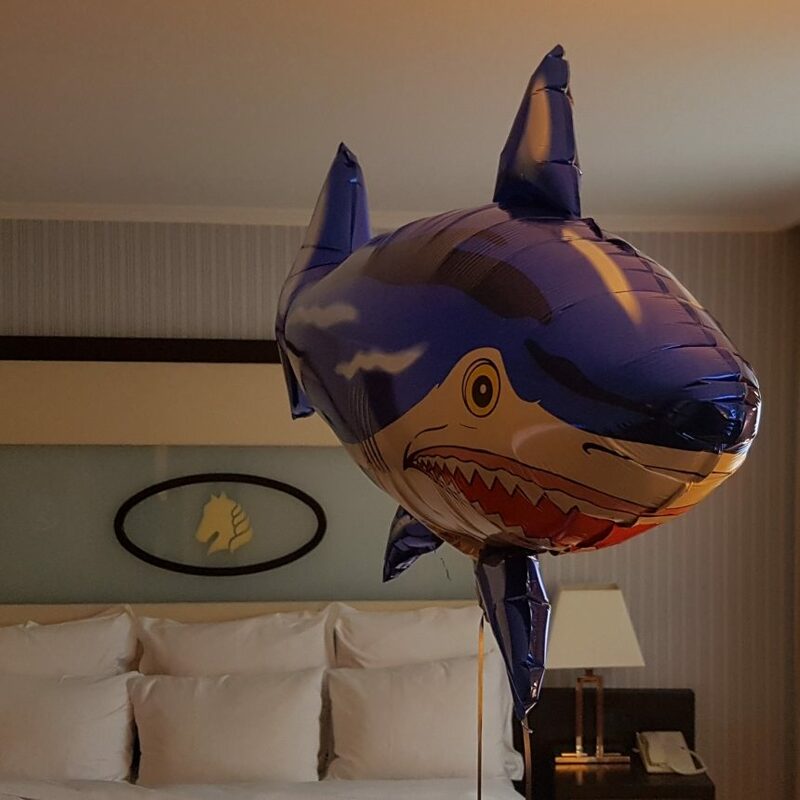 During Sharkfest I talked to a couple of people about my own TCP expert I am writing and what kind of problems they had with the Wireshark TCP expert. The biggest problem seemed to be that various versions of Wireshark diagnose different sets of symptoms for the same pcap file, and sometimes symptoms that were correctly diagnosed in earlier versions disappeared or changed in later versions. And some pcaps are not diagnosed correctly in any version of Wireshark, so there’s even more work required fixing that. One of the reasons for that is that the core developers are not very experienced when it comes to TCP analysis (except Sake), so it’s hard for them to build code that does the right thing and doesn’t break working symptoms. This way we should be getting to a point where we can improve the TCP expert of Wireshark without constantly breaking it in other places. The pcapng capture file specifications available here haven’t changed in quite some time and seemed to be deadlocked when Sharkfest EU 2018 started. There were attempts to improve it in the past but there was no clear decision process, so everything always ended up in a limbo state. 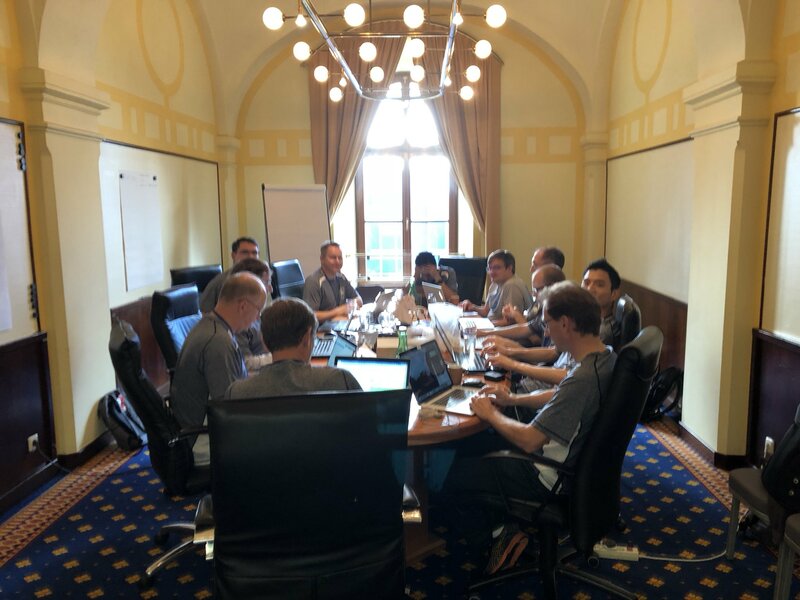 The core developers approached me in Vienna since I had tried to push the specifications for a couple of years and asked me to help them out getting things moving forward. The main problem is that new block types and other details need to be added to the specifications to allow new features in Wireshark, e.g. the ability to store crypto key information in the file to allow decrypting protocols like WPA which is quite cumbersome right now. To solve the problem of not being able to make final decisions about how to proceed I volunteered to do exactly that, under the condition that the Wireshark core developers support that by implementing the changes we make. That way we will make sure that Wireshark will be able to read and write the current specifications so that others can see how it works. And let’s face it – if Wireshark doesn’t support a capture file format it’s not very useful. My current plan is to get rid of the experimental blocks first, and designing a procedure to allow adding more block types in a controlled way. It will take a little time to get things rolling, but we’ll finally get something done. I have one story that happened to me during Sharkfest a while ago. I was in California, standing outside in a group of people outside during the traditional developer dinner that proceeds each Sharkfest. The people next to me were Gerald Combs (creator of Wireshark), Thomas D’Otreppe (creator of Aircrack-ng), Mike Kershaw (creator of Kismet) and Gordon Lyon (a.k.a. Fyodor, creator of nmap). And I was like “wow, that is sooo cool talking to theses guys!” – well, that’s what Sharkfest is, too. Rule 1 in action. Rule One: Talk to each other. That includes presenters, core developers, staff, etc. It makes the magic happen, as lined out in the paragraphs above. In the end, Sharkfest is only possible because of many people donating their time and money to make it happen. That includes all of the sponsors that showed up at one or more of them, presenting their solutions and sponsoring various aspects of the conference. I also need to mention Laura Chappell, of course, who ran her successful Wireshark training class at the beginning of each Sharkfest. Thanks to all of you! And then there are Janice Spampinato and Sheri Najafi without whom Sharkfest simply would not be possible. I have a little more insight than most into the huge amount of work both of them put into it to make things run as smoothly as possible, and they’re both doing an amazing job. I mean, running not one, not two, but THREE Sharkfest conferences in one year (2018: Asia, US, EU) is really hard to do, and they did it. Another big virtual round of applause, everybody!